While the world’s still choked with monsters – The Work of the Monster Aces is never done. And now, the second volume of Jim Beard’s fearless pursuers of things that go bump in the night is available as a high quality audio book produced by Radio Archives! Tireless and dedicated, the Monster Aces scour the globe in pursuit of the creatures that seek to terrorize humanity. For this ongoing mission, they leave no stone unturned – and no monsters alive. Whether it be in far-off wilderness, small town America, or among the concrete canyons of the big city, Cap’n, Gats, Joker, Digger, and Trill continue to risk their lives at the cost of their own identities to keep us safe from the things that go bump in the night. The Earth’s Greatest Monster Killers return in six all-new tales of terror, pure pulp action-adventures that will chill and thrill you all over again…as well as make you look twice under your bed. The Aces are challenged as never before, as they face off against not only a Murderer’s Row of horrors, but with their own motives and the lives they’ve chosen to lead. Through these stories you will see a side of the intrepid band of adventurers that you’ve never seen before. 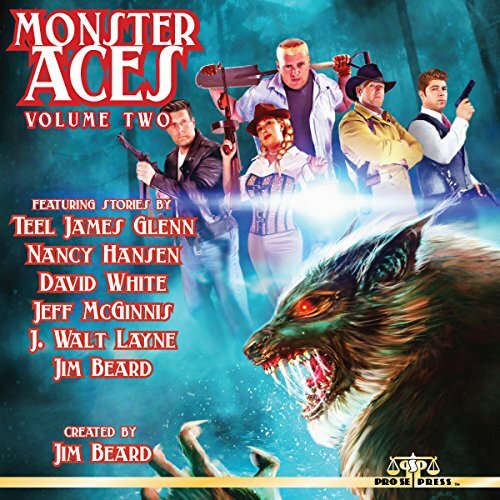 Concept creator Jim Beard welcomes David White, Nancy Hansen, Jeff McGinnis, J. Walt Layne, and Teel James Glenn to aid him in continuing the Monster Aces’ mission – destroy all monsters, or die trying. MONSTER ACES VOLUME 2. From Pro Se Productions. This chilling second Monster Aces audio book is also available on Audible and Itunes. MONSTER ACES VOLUME 2 is available in print and digital formats at Amazon and www.prose-press.com.